You are met at the airport by Fortis Travel representative and transferred to your hotel. Today explore Cappadocia with its extraordinary chimney-like rock formations. Tour Goreme with its rock churches decorated with frescoes. Then visit the Byzantine monastic complex of Zelve and the village of Avanos, which is famous for its traditional pottery. Drive to Konya and on the way visit the 13th century Caravansarai. In Konya visit the museum of Mevlana, known in the western world as Rumi, the former convent of the Whirling Dervishes and the great Islamic philosopher. 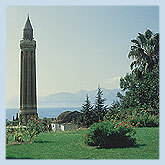 After a beautiful full day drive through Anatolian plateau arrive at Antalya, a beautiful Mediterranean town. 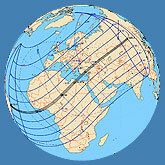 Antalya Total Solar Eclipse Day!! Depending on the weather, we will find an observing site in town or drive inland. Picnic lunch while awaiting the Solar Eclipse. Drive to Izmir. On the way, visit Pamukkale, famous for the immense tiers of white limestone terraces filled with mineral water. Visit Ephesus the most complete archaeological ruin in the Mediterranean. The city is dedicated to the goddess of Artemis, whose temple is one of the Seven Wonders of the World. Then visit the Ephesus Museum, the basilica of St. John and the house of Virgin Mary. Morning flight to Istanbul. Visit Topkapi Palace, St. Sophia, Blue Mosque, Hippodrome and the amazing underground cistern. Relax with a cruise on the Bosphorus on your last day in Turkey. In the afternoon explore the famous Grand Bazaar.